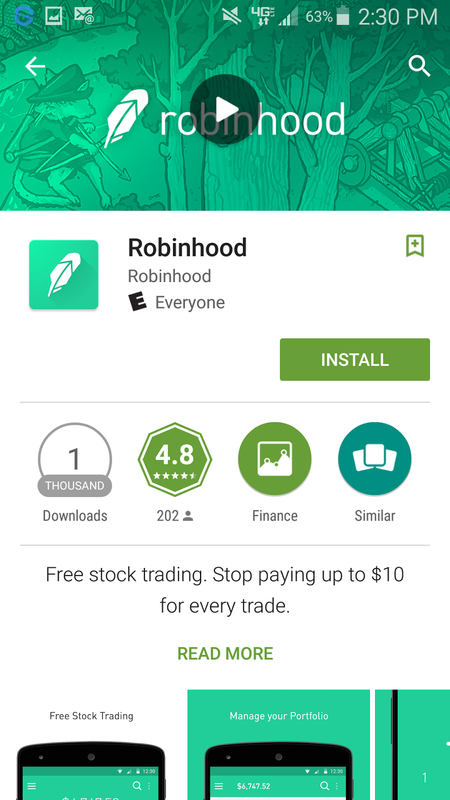 I will preface this blog post by saying that I will have multiple posts about Robinhood. I was scrolling through my twitter feed on August 13th and saw a tweet from @RobinhoodApp that Robinhood was available for Android. I was super excited because I have been following Robinhood for maybe a year now? I don't remember quite how long, but I've been following them for awhile. As with a lot of Apps, it was released on iOS first, and I wasn't sure how long the Android version was going to take. Everything so far has been super smooth with Robinhood. I really enjoy the app. The founders of Robinhood are 100% correct when they say that $10 commissions can eat profits/gains all up. I think some people might say, "If you can't afford a $10 commission to buy and sell ($20 total), then you don't have enough money to trade." I myself personally am interested in stocks and want to participate in trading, and yes, I rarely traded on my TDAmeritrade account because of the $10 commissions. I have a lot more screenshots to share about my experience so far with Robinhood, and I also will be talking about my investing plan with Robinhood. I am looking forward to all of the money I will save by not paying commissions. I will end this post by saying I hope Robinhood doesn't ever take away the $0 commissions.